Summary: Alfredo tells the story of his life in Mexico, how his father was no longer able to support the family, and his parents’ decided to send him and papa north to the United States. A coyote led the two of them to the Rio Grande, gave them an inner tube to float across, then disappeared with their money. After a grueling week of traveling on foot, they found a shack to sleep in, and a friend of Alfredo’s grandfather picked them up and drove them to Texas. They settled in to the Embassy, a collection of broken-down vehicles parked behind a factory. When Alfredo started school, his father gave him a $100 bill to buy a bus ticket back home if he was picked up by immigration officials and sent back to Mexico. After a difficult transition, Alfredo enjoyed school. President Reagan granted amnesty to immigrants, and Alfredo and his father were able to start the path to citizenship. Best of all, four years later, the rest of the family was able to come to the United States. 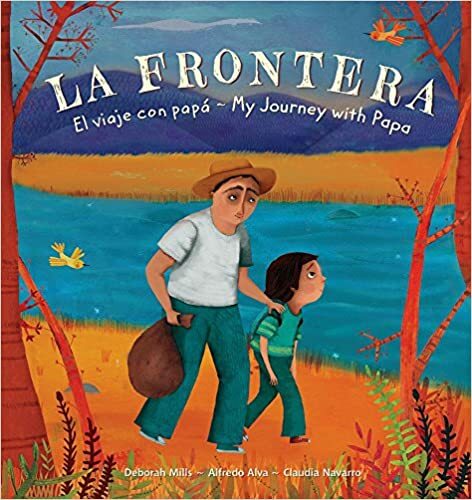 Includes photos of Alfredo and his family, and extensive information on Alfredo’s story, borders and culture, and immigration. In English and Spanish. 48 pages; grades 1-5. Pros: A grittily realistic story of a family seeking a way out of desperate poverty in the United States. Although it takes place more than 30 years ago, the story is more relevant than ever to readers today. Putting a face on “illegal immigrants” will help students have greater empathy for others in a similar situation, and those who have experienced a journey like Alfredo’s will feel a connection to him and his father. Cons: Too bad certain government officials in Washington, D.C. aren’t reading this.